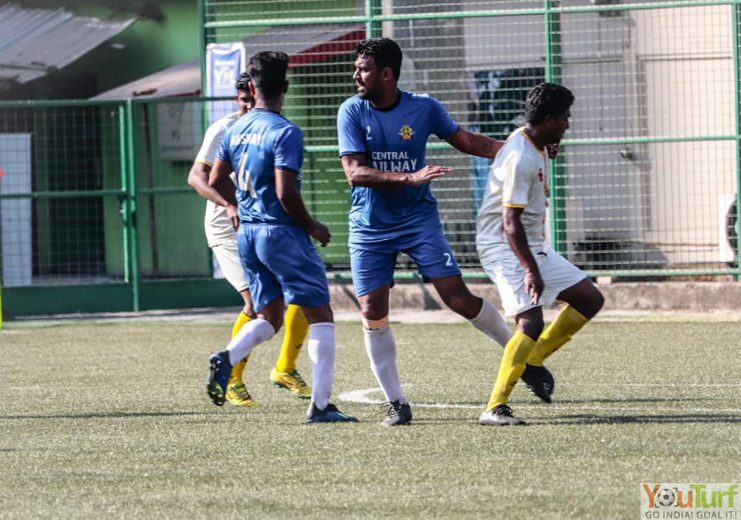 11th February 2019, Mumbai: Central Railway recorded their best win this season after a comprehensive 4-1 win against Maharashtra State Police in the MDFA Elite Division (Corporate Group) at the Cooperage Stadium. In the other game which was played on Sunday, FSI Seaview defeated Salcette FC 4-0 in what was a one-sided encounter at Cooperage. On Monday afternoon, Central Railway encountered M.S Police and went on to register a thumping 4-1 victory to get back on track. It could have been more had the Railways was clinical in the first-half. M.S Police showed great intent in the first-half and broke the deadlock in the 43rd minute through Sagar Basle. The Railways responded brilliantly in the second half. Ajinkya Nalavade’s thumping header two minutes into the second-half leveled the score for Railways before striker Shahbaz Pathan decided to go on a rampage mode. Shahbaz Pathan’s second and third goal was nothing short of an exquisite finish. Both the strike was perfectly executed from the outside of his left foot. A great day for Shahbaz Pathan and the Railways as they get back on track with a memorable win.